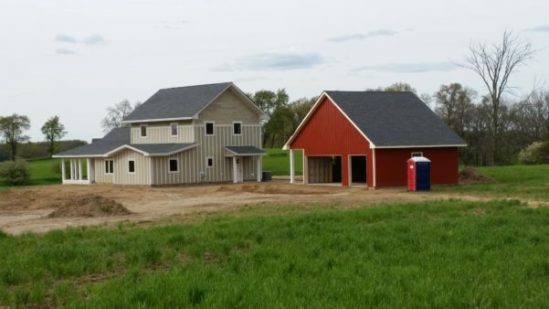 The contemporary farmhouse is sided and waiting for paint. The garage is now built. Insulation has gone in. 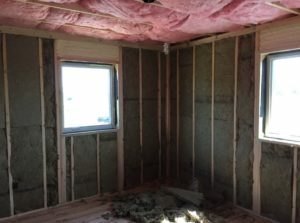 Roxul insulation is being used in the walls and fiberglass batt insulation is going in the attic. Spray-foam insulation is applied to the window headers which tend to be places that leak heat. 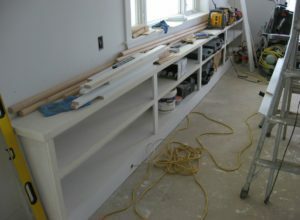 The trim around the windows and doors, the baseboards, and the custom built-ins are being installed. Above you can see the custom bookshelves in the living room, sized to tuck under the windows, are being put to good use by the builder himself. During the design phase it is easy to say, “oh, we can plan that built-in for later, or maybe we can find something ready-made.” My experience has shown that later is often much later (years and years) and rarely can a person find a piece of ready-made furniture to fit and look built in. There are a few key places in a home that it just makes sense in which to include the built-ins right away. Heavy-usage rooms such as living rooms, kitchens and baths just function better right from the beginning if the built-in storage is included during construction. It also helps with flooring, lighting and electrical planning. Soon to come is interior and exterior painting, cabinetry and flooring. Mark Allor, the builder, has been working with the Owners to keep the project moving along and getting their regular input on decisions that remain. Stay tuned for additional updates.